If you became an engineer because you are curious about how the world works, you’re in good company. Danielle George wants more people to stay curious and encourage the next generation of engineers to solve the big challenges. It’s questions like these that are important for engineers to answer, even when asked by an unimpressed stranger after you’ve explained your life’s work in a public presentation. For Professor Danielle George, who has helped develop tools to map the universe and who is drawn to humanity’s greatest challenges, unexpected – even slightly rude – questions like “why bother?” are fine. They’re even part of the reason she spends so much time speaking about her work in public. Sometimes it’s a similarly pointed question like “where does this money come from, and is it being spent well?” about a multi-nation, mega-project like the US$1.5 billion ALMA (Atacama Large Millimetre Array). “You have to say well, we bother because we’re curious, and that is human nature and we shouldn’t stop being that, and we shouldn’t hide the fact that we are curious, and I think that’s a good thing,” George said. The University of Manchester Professor of Microwave Communication Engineering believes engineering lacks role models, and could do a better job explaining the considerable contribution it makes to the world. Though she confesses public speaking makes her a little nervous, she’s duty bound to do a lot of it, even if it means being asked “why bother?” from time to time. This means that, outside of her ‘day job’, George counts 67 public lectures given in the last academic year. In 2017 she also presented or co-presented three BBC documentaries. Her ‘day job’ also includes heading teaching and learning for the university’s science and engineering school, with its headcount of 10,000. 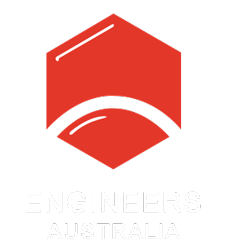 The outreach effort is driven by a need to show that engineering is a creative, worthwhile, and misunderstood profession, which doesn’t really have a champion putting its importance forward in terms everyone can understand. “In terms of engineering, there aren’t a lot of role models… You can think of people in physics, for example, the likes of Brian Cox, you can think of champions in natural sciences, history, geography,” George said. George’s love of astronomy emerged at age eight, after being bought a telescope by her parents. She quickly found herself waking up during the night to track lunar eclipses, and realising that maths and science could be put to enjoyable uses. She came late to engineering, earning a Bachelor’s degree in astrophysics and then a Master’s in radio astronomy, both at Jodrell Bank Observatory (JBO). Following this, George decided she wanted to work on a practical project for her dissertation, and soon “a lightbulb came on for me that engineering was my passion!” she wrote in this article. Her work after this on low-noise amplifiers as an engineer at JBO and her first major project (contributing to the European Space Agency’s Planck spacecraft mission) became her PhD thesis. “That was an amazing project, certainly as a junior engineer, to be able to work with all these amazing people around the world and learn so much from them,” George recalled of the project to measure and map the cosmic microwave background relic radiation released through the Big Bang. Efforts developing extremely sensitive systems to pick up faint radio wave signals could be applied to some of the biggest problems engineers are tackling. So far, George and her teams have looked at applications as diverse as precision agriculture (developing buried sensor networks for monitoring sub-soil characteristics such as temperature and moisture) and monitoring the performance of Rolls-Royce gas turbines, using “fundamentally the same technology”. The radio frequency (RF) expert has also developed amplifiers for the low-frequency aperture arrays of the Square Kilometre Array (SKA) project, which will be the largest-ever radio telescope, and with 50 times the sensitivity of anything currently in existence. Her role in this “is much less now” since going on maternity leave in late-2014. 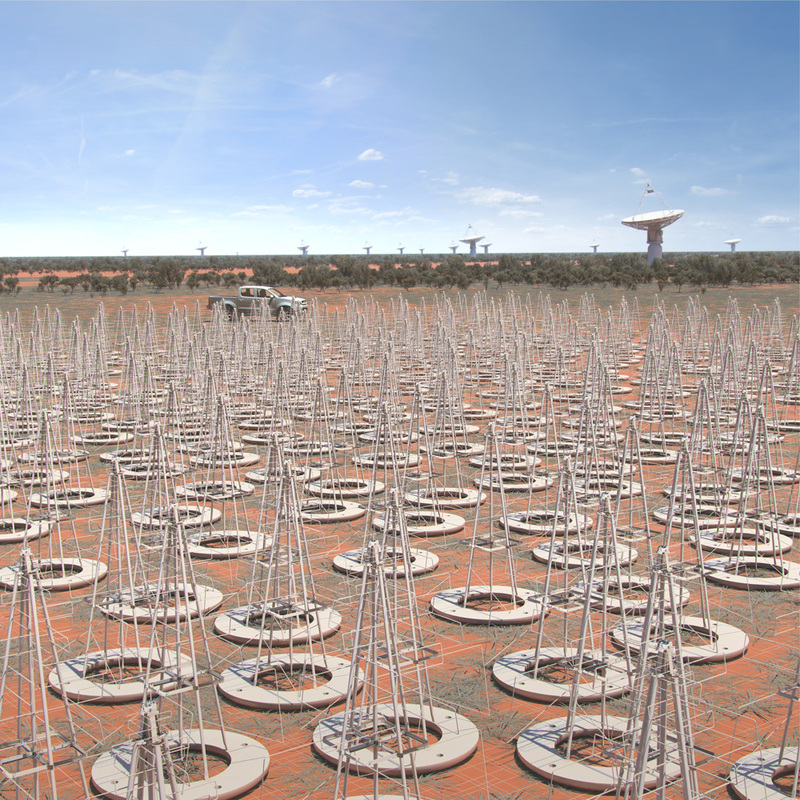 Elements of the Square Kilometre Array (SKA) in Western Australia. The project, using millions of low-noise amplifiers, has “absolutely turned how you would approach a radio astronomy project on its head”. Where other telescopes have allowed for development and later tweaking of components, there is no such luxury for the SKA, which has headquarters at JBO and core sites split between Murchison, Western Australia, and Karoo, South Africa. Performance of these devices needs to be high, while the approach for making them is akin to high-volume electronics manufacturing. “You cannot have this idea of a few technicians in a lab tinkering with some amplifiers in order to get them to have the best performance,” George said. The year 2014 was a standout for George’s work as a public engineer. She was approached to pitch for the prestigious Royal Institution Public Lectures, and was successful. Her three presentations – titled Sparks Will Fly: How To Hack Your Home – made her only the sixth woman in 189 years to give the lectures. Danielle George at a Robot Hack Day. One of the episodes featured a robot orchestra, an idea built on the following year as Manchester prepared to become the first city in the UK to be designated a European City of Science. 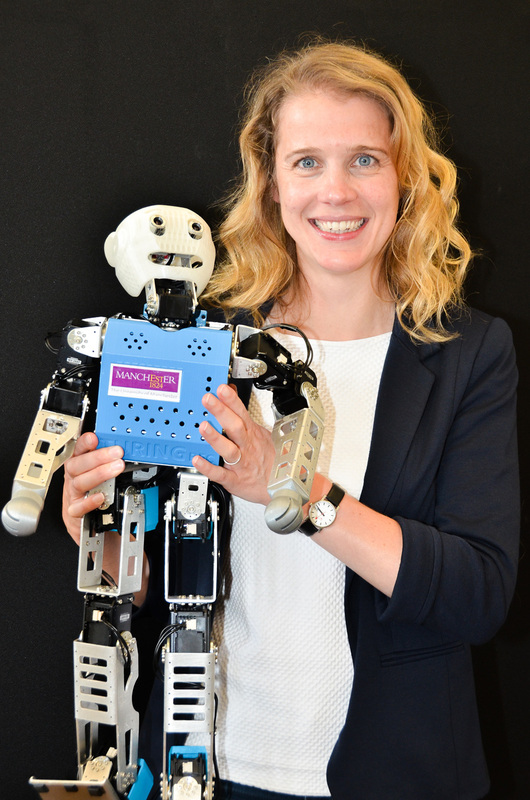 “We developed this recycled robot orchestra with the idea that we, me and my team at the university, wouldn’t develop the robots, we’d get children to develop the robots. Their imaginations just took it to another level,” George said. Knocking around ideas in 2015 to mark Manchester as a European City of Science in 2016, Dr Erinma Ochu and Danielle George suggested concepts based around recycled instruments and making/hacking respectively. The two founders of the idea found a way to combine these in a way they thought might be fun for ‘citizen engineers’ to be involved in. “I think I wrote half a document, she wrote the rest of it and within a couple of days we just had this idea of doing a recycled robot orchestra,” said Ochu, a Lecturer in Science Communication & Future Media at the University of Salford. Ochu, a neuroscientist who moved into science communication, is a believer in what can be accomplished when you get enthusiastic amateurs together to tackle a problem. She was confident the Manchester recycled robot orchestra was a winner early on. “Danielle had some recycled floppy discs that made a robot and it played the soundtrack from Rocky and she just played that,” Ochu said. The array of ‘instruments’, such as disused floppy drives and cereal bowls grew through hackathons and random donations. The local Halle orchestra came on board and rehearsed with their conventional instruments. The project did indeed fly and the motley collection of robots and musicians continues to play at festivals and star on TV shows. For all the fun, the ‘citizen engineering’ project also addresses a serious topic: showing children that tasks like assembling electronics and coding can be creative and fulfilling. Why are robots so often so good at this job? George believes robots are captivating for the same reasons things like space, dinosaurs or ancient Egypt are. “With dinosaurs, for example, they were there but they don’t exist now so you need a certain amount of imagination to create an environment where dinosaurs would be alive and around,” she said. The project attracted support from Siemens (which built a robot conductor), the Women’s Institute, National Trust, Manchester Metrolink, Manchester’s Halle orchestra (which performed alongside the robots which were made of salvaged old floppy disks and desk fans) and others. The orchestra continues to perform, playing at a 45,000-people festival a fortnight before create spoke to George, and was featured in a BBC program about a lighthearted quest to replace singer Ed Sheeran. “It’s gone from strength to strength and, because of the imagination of the children, it continues to go from strength to strength,” she said. 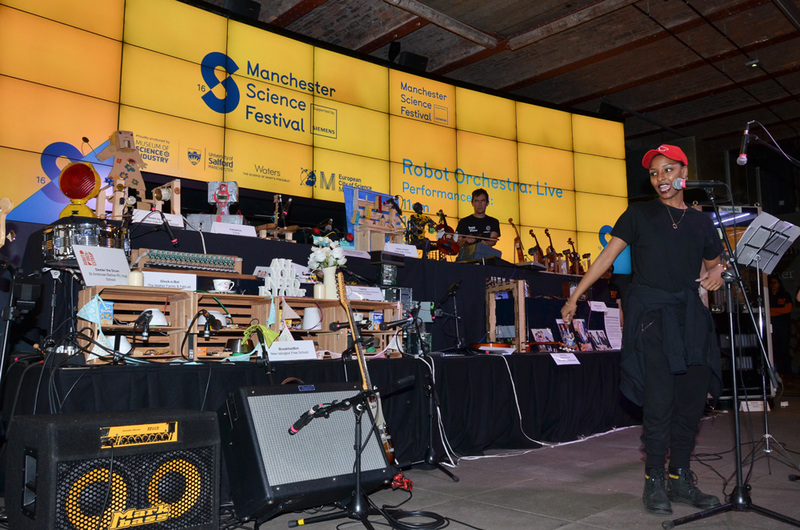 The Robot Orchestra performs with local artists at the Manchester Science Festival. It’s another part of George’s mission to engage people – particularly the youth, but also those who influence them. It’s a mission that means routinely and willingly stepping out of her comfort zone, whether it’s through regular public lectures, an increasing volume of TV and radio work, and even willingly teaching first-year undergraduates electronic circuit design. “I am a firm believer in that you don’t know your subject until you try and teach it to undergrads or teach it to the next generation,” she said. There’s arguably a need to do better in attracting the next generation of problem solvers, and to communicate what engineering involves and why the profession is important if the challenges of our times are going to be overcome. So, if you’re focused on these challenges and you’re asked ‘why bother?’, then you should be happy to answer. “I think part of the reason people ask you the question is because they’re unaware of what you’re doing and why you’re doing it,” George said.